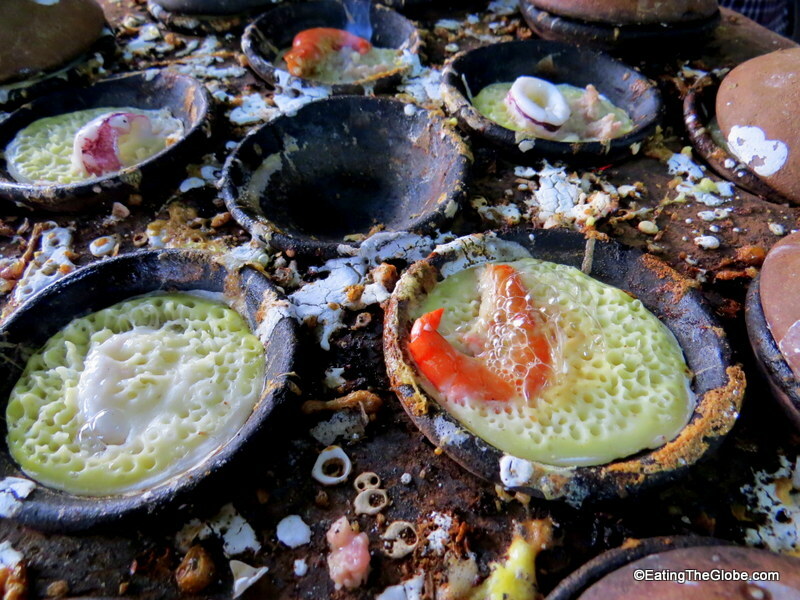 Vietnam has some of the best street food around, but it can be confusing if you aren’t familiar with it. 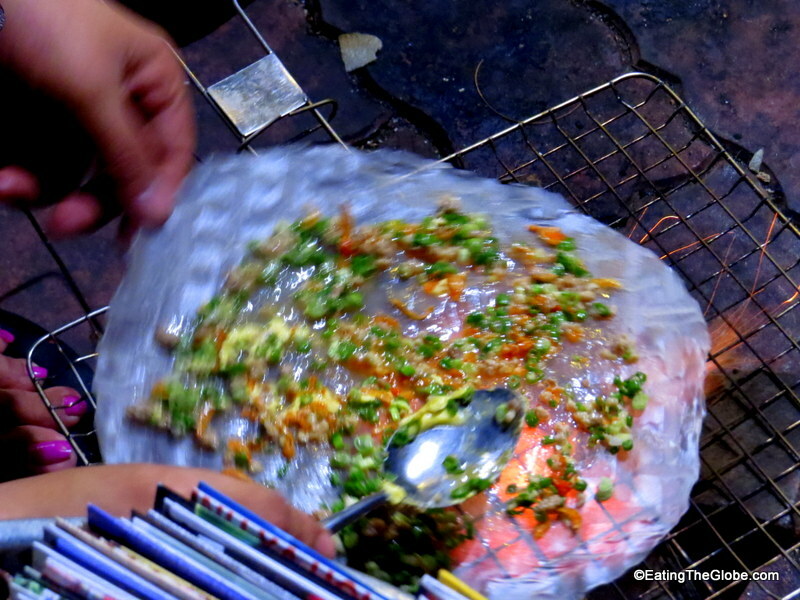 I wanted to be steered in the right direction, so I booked a Vietnamese street food tour with Saigon Food Tour. I did the Taste Of The Night tour which was a tour by motorbike that highlighted the best of Vietnamese street food and BBQ. 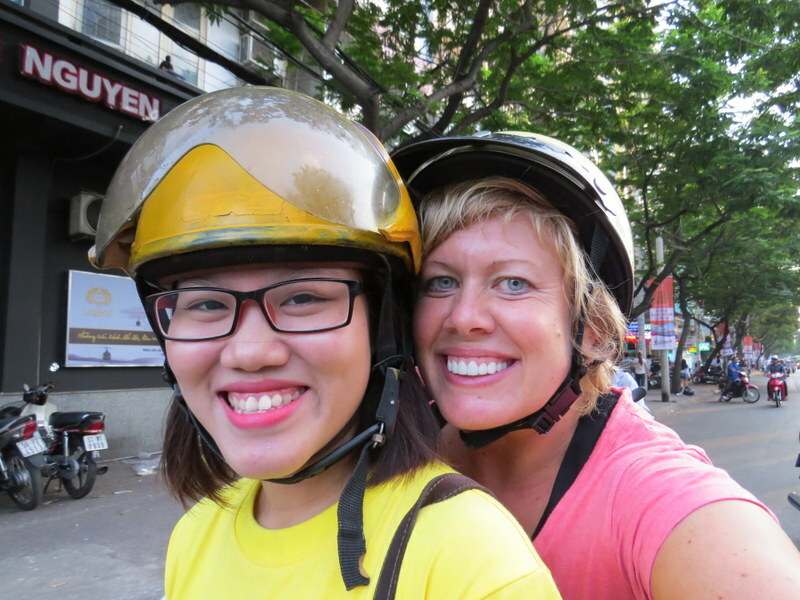 Experiencing the Saigon rush hour was something of a cultural experience itself. I was amazed at how the traffic flow all seemed to work, and I thought my driver was very good, so even though it was a bit hectic, I felt perfectly safe. At our first stop we devoured Bánh xèo, the Vietname crepes, and Bánh căn, the mini Vietnamese pancakes. The Bánh xèo was light and crispy, and filled with shrimp, pork, and bean sprouts. To eat it, we wrapped it in the many herbs that the Vietnamese use for their meals. I loved learning about all the herbs, many of them I had never heard of. It was so fresh and delicious. 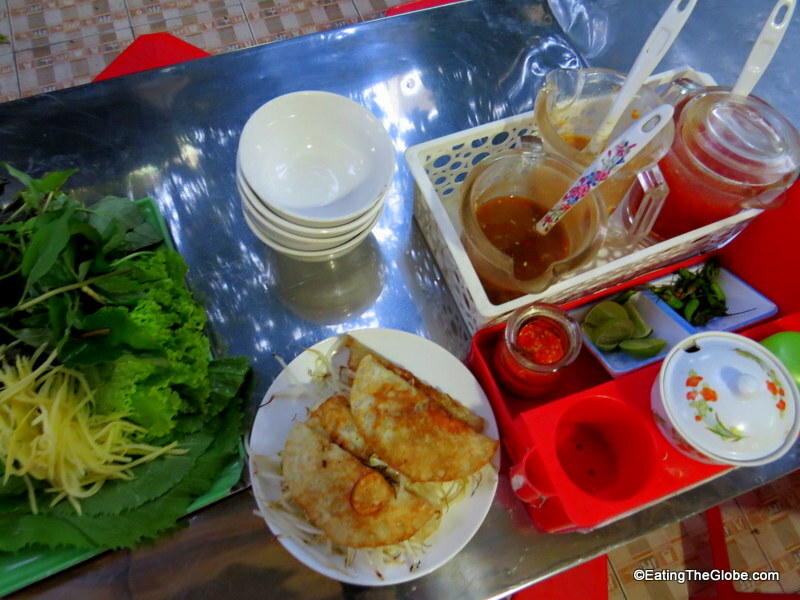 Our next stop was a local spot where we had a special Vietnamese crab soup called banh canh cua. In the soup was a sausage made from crab which was very good. The soup was very flavorful, and we got the experience of sitting in the local chairs that are about two inches off the ground! My favorite part of the evening was watching the slice of local life that happened along the river. 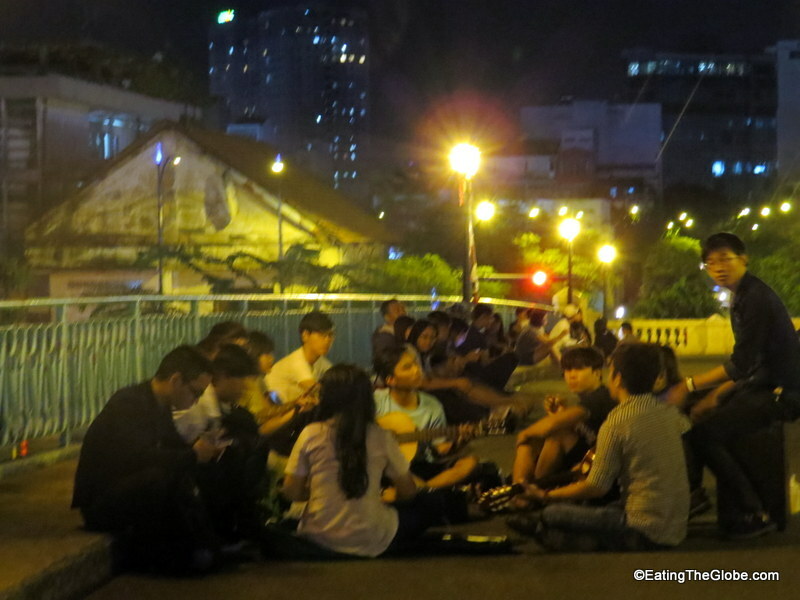 Teenagers don’t go to bars in Saigon. 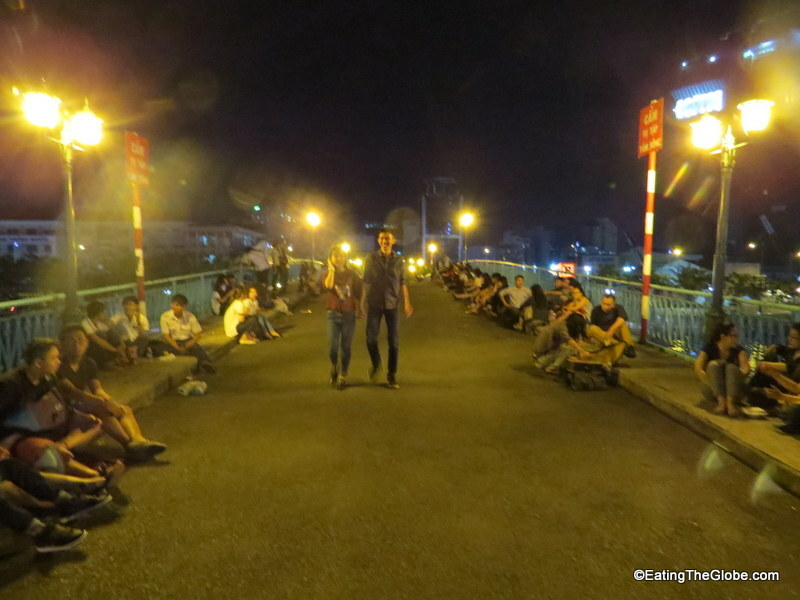 They gather and play music together right on the bridge, or they meet in coffee houses. 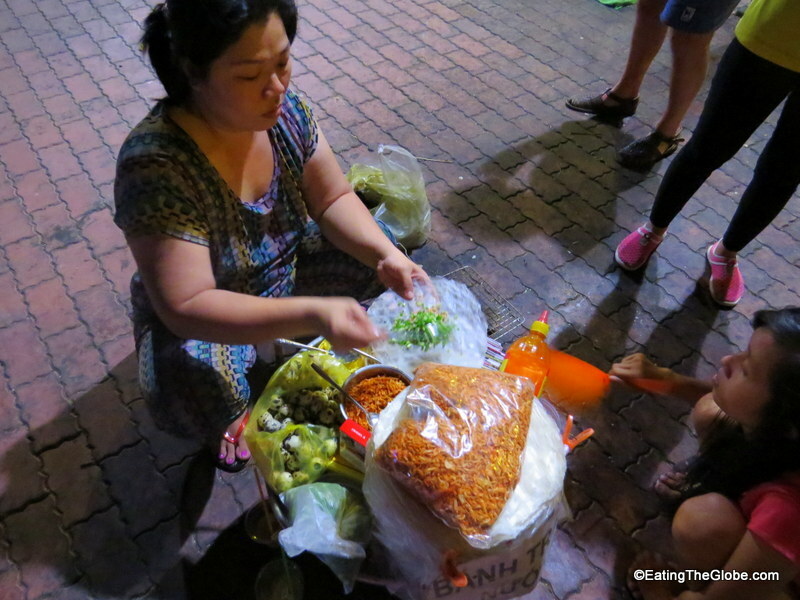 We then sampled my favorite street food of the night from a vendor next to the river. Bánh Tráng Nướng is Vietnam’s form of pizza. The vendor put quail eggs, ground pork, chili paste, dried shrimp, and green onions inside of rice paper and grilled it. It was so light and crispy and very flavorful. The night didn’t end there. 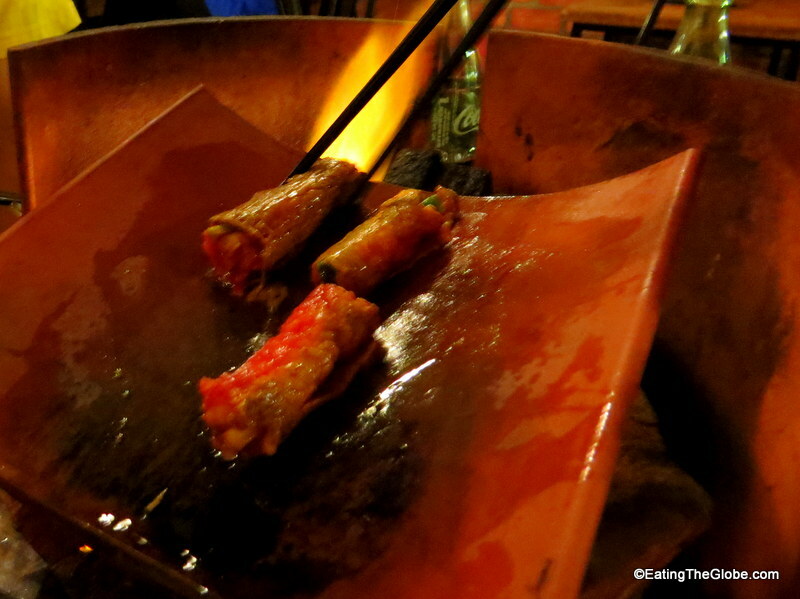 We were whisked away to an unusual Vietnamese BBQ joint where the meat was grilled on clay roof tiles called ngói. This place seemed to be a favorite of the locals and the tabletop grilling was a fun dining experience . We ended the evening sampling the various desserts that Vietnam offers, so we didn’t end the evening feeling hungry. It was a great tour, and I loved getting to taste many of the Vietnamese foods that I may have missed otherwise. 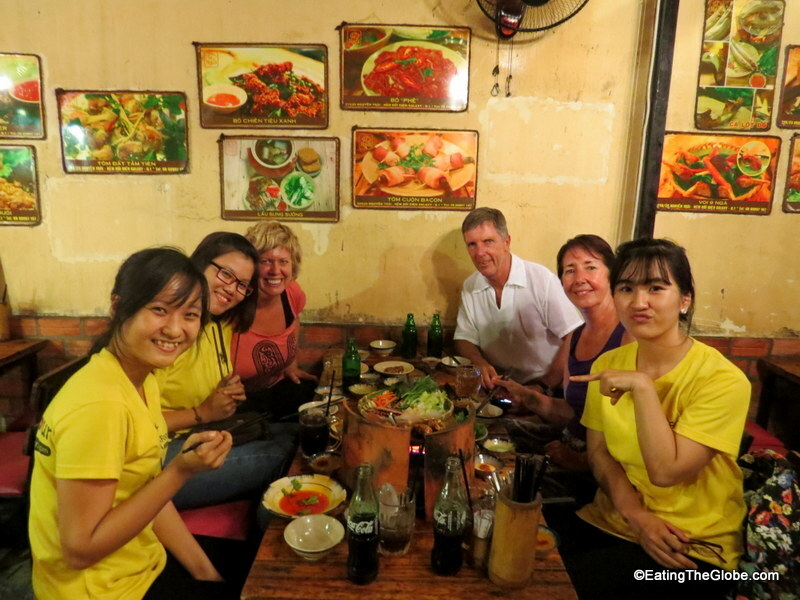 You can book your Vietnamese street food tour at Saigon Food Tour. They offer two night tours, a morning tour, and a cooking class. 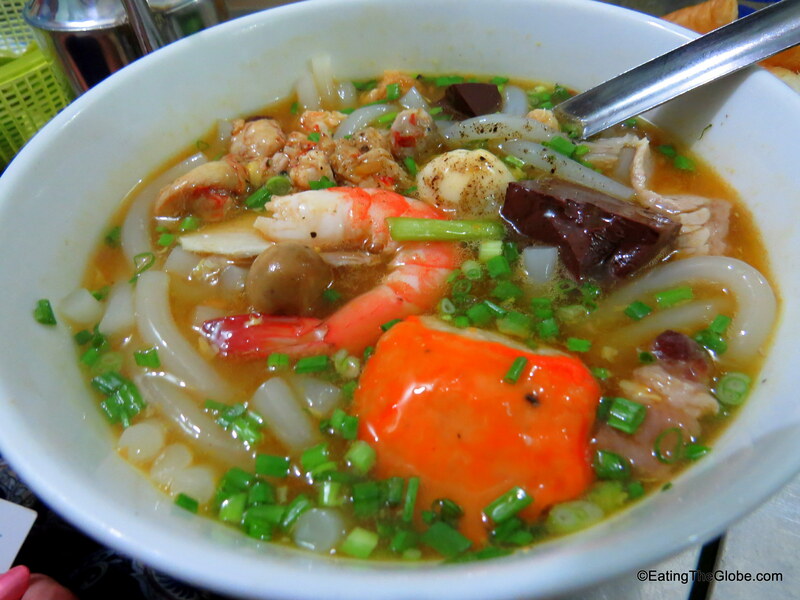 3 Responses to "Eat Vietnamese Food In Saigon On A Saigon Food Tour"
This all looks so good, especially the Vietnamese “pizza.” I can’t wait to go and try some out! Thanks for this post, maybe I will consider a food tour when I go. I highly recommend a food tour.You will try things you probably wouldn’t on your own.